Just try to be a little bit more expressive than you might normally be, but smile a lot, relax and enjoy it. Ben Ingram is the pride of Florence, South Carolina. 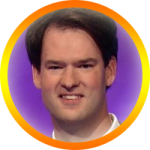 He was an eight-time Jeopardy! champion, winning over $177,000 dollars. He then went on to defeat Arthur Chu and Julia Collins to win the 2014 Jeopardy! Tournament of Champions. Jeopardy! is a lot different, audition-wise than any other game show, and when we spoke, he explained exactly why. “This is something I won’t forget: it was in I think September or October, later that year. I was actually in India, of all places. I was working for a different company then than I do now. They wanted to send some of their newer employees to work off-shore for a few months just to get to know the people and get to know the company better. I was there for a couple of months and I was very, very homesick. And back then, I had to work late at night so the hours would match up with the States. I was waiting for the cab to pick me up and take me back to my apartment, so I checked my personal e-mail in this deserted office building in India, and I didn’t hear anything from home. But I was so homesick and honestly so desperate for human contact that I checked my spam folder. And there was an e-mail in there from Jeopardy! Productions and it said, ‘Dear Mr. Ingram, we’d like to invite you for an in-person audition in Baltimore on December 1st. Please reply within 48 hours.’ I checked the time stamp, and it said ‘Sent 47 hours ago.’ So, that was close.” Let that be a lesson to you, potential Jeopardy! champions: check your spam folder. His audition was in Baltimore, right near the dicey Light Rail tracks that cross Lombard Street. “My interview was in the afternoon. We weren’t staying in the hotel where the audition was. We went in, grabbed a bite, had a drink, went upstairs. There was a big easel in front saying ‘Jeopardy! Contestant Auditions.’ They said, ‘Here, fill out this form, and go into the lobby and sit down and fill it out.’ There were about a dozen people just scattered around the hallways. Some leaning against the wall, some sitting on the floor, some sitting in chairs, and you could tell some of them because they were toting almanacs and newspapers and atlases under their arms, sort of last-minute preparation, I suppose.” The form had all your basic information but also asked for five fun facts about yourself. Tips are scattered throughout this guide on how to make yourself as interesting as possible for these facts. Prepare ahead of time, frame the facts in an interesting and engaging way, and try to think outside of the box. I asked Ben what the actual audition process was like. “They did a great job of making it a fun experience. At first, it just seemed kind of hokey. They’re all just saying, ‘hey guys, a lot of applause, a lot of laughter’ and everything. They were shouting out clues at us and asking us to give responses. You know, just raise your hand if you think you know a response. They didn’t call on me until almost the very end, but what they called me on was, it was one of the two word play categories that usually always come up. They were Before & After and Rhyme Time. They called me for one of those and I got it, and that made me feel pretty good.” Jeopardy! can be a creature of habit a lot of the time. Knowing categories that come up a lot can be beneficial for preparing against gaps in your knowledge. Preparing for those can be found in our Show-Specific Resources page at the end of this article. Just listen to the contestant coordinators because they’ve been in show business for a long time. Like, decades among them. They know what makes a good contestant. As someone grades the test, the contestants play a mock game. To Ben’s surprise, they didn’t have an initial cut of contestants. “I thought they were going to make a cut then, like you get a passing score? No one knows what a passing score is. I thought if you didn’t get a passing score, they were going to cut you. But those were the old days. They don’t cut anybody anymore.” He surmises it’s because the online test did a lot of cutting already, and it’s poor form for someone to travel so far to miss out on the whole experience. During the mock game, three potential contestants were chosen to play a mock game, complete with mini game board and signaling devices. “They encouraged you to hit the button more than once. I thought that was a trade secret. I had done my homework after I found out I was going to be auditioning. I had read up on some tips from some of the more successful contestants, and most of them said, ‘hit the button more than once.’ So I thought I had an advantage because I had kind of a trade secret, that only a few other people knew about. But the contestant coordinators encouraged everyone to hit the button more than once, I thought to myself, ‘well, there goes all that research, what’s the point?’ I felt like I didn’t have the leverage anymore of having that secret in hand.” Another lesson, future champs: always listen to what the contestant coordinators tell you to do and DO IT. After the mock game, they tell everyone that they’re in the contestant pool for the next 18 months. If they don’t receive The Call beckoning you to Los Angeles within 18 months, you’re eligible to take the test and hop back in. I registered and I wound up just taking it on my laptop just lying on the floor in her apartment in Spartanburg, and it wound up working out.